In 1977 Jeff Shadbolt organized his friends into a "band" called The Sockets with the sole intention of getting chosen to open a Buzzcock's gig. No matter that they could barely strum a chord or hit a note, the plan worked. In 1978 they changed their name to the more modish Purple Hearts and kept learning to play their instruments, kept gigging, and kept building a fanbase. The Purple Hearts threw themselves into the mod revival, and combined the energy of punk with sixties power pop more similar to the sound of The Jam then most of the other revivalists groups of the era. They didn't have the soulfulness of the Chords, or the radio friendly pop sound of the Lambrettas, and they weren't the scene leaders that Secret Affair became. Still, the band was adored by British mods and arguably one of the most popular bands throughout the mod revival. 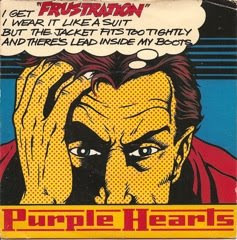 The song here, "Frustration" was their second single and was featered on their first fantastic, and beloved, album Beat That. 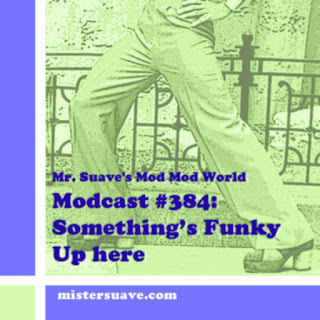 The band soldiered on through the 80s even as the mod scene withered, mod revival bands fell apart all around them, and their members left periodically to play in other groups. They produced a second studio album circa 1985, Popish Frenzy, that didn't fare as well, nor catch the loving attention that Beat That had. Now here we are 30 years on and the group is reformed and scheduled to play the 100 Club June 21st with other shows to follow throughout the summer. I wonder if they'll make it to Seattle?